26 In the sixth month of Elizabeth’s pregnancy, God sent the angel Gabriel to Nazareth, a village in Galilee, 27 to a virgin named Mary. She was engaged to be married to a man named Joseph, a descendant of King David. Some manuscripts add, Blessed are you among women. Indeterminate from the Bible quote above. 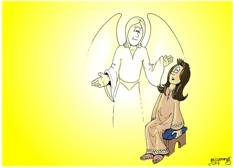 Glow from angel forms the lighting for this cartoon. Although this is the seventh scene in this “Births foretold” series of Bible cartoons, it is actually a very old Bible Cartoon. 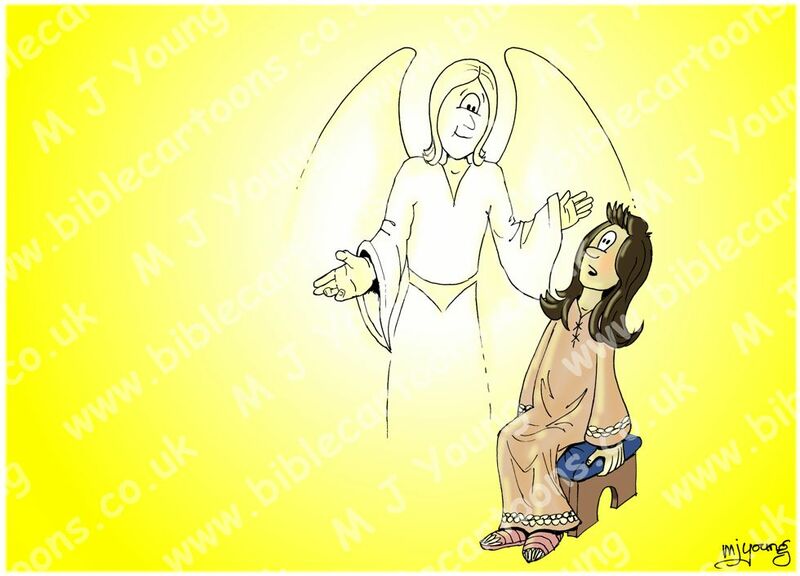 I started the Bible Cartoons Project in 2008 & this particular cartoon is the 13th one I drew. I think you can see the simplicity of my early design style in it, especially compared to the more complex lighting & contents of the latest ones. Compare this scene with the next one (Luke 01 – The Nativity – Births foretold – Scene 08 – Jesus birth foretold) & you’ll see what I mean. Nevertheless I have decided to keep this early cartoon in this Births Foretold series, rather than re-drawing it.